“I would like to introduce you to my present and the rest of the world’s future. It’s been just over 15 years (Seriously?! 15?!) since Leigh Whannell burst onto the horror scene alongside James Wan with Saw. And while Wan has gone on to direct titles outside the horror genre like Furious 7 and Aquaman (both of which crossed the $ 1 billion(!) threshold at the box office), Whannell has largely stayed within its confines, also helping birth the Insidious franchise with long-time collaborator Wan. He then tried out the director’s chair on Insidious: Chapter 3. “I am Stem. The system operating your body for you. 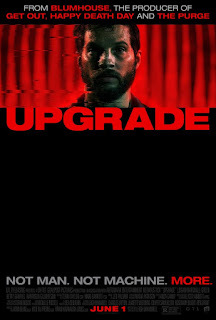 Set in the near-future, where technology has become even more all-encompassing than it already is today, Grey Trace (an excellent Logan Marshall-Green) suddenly finds himself a quadriplegic after a vicious attack. Bitter and despondent, he’s given a chance to walk again by wealthy tech mogul Eron Keen (Harrison Gilbertson, who was in Amazon’s recent TV adaptation of Picnic at Hanging Rock). But what could have been a second chance at a normal life becomes a bloody vengeance spree with the help of Grey’s new best friend, Stem. 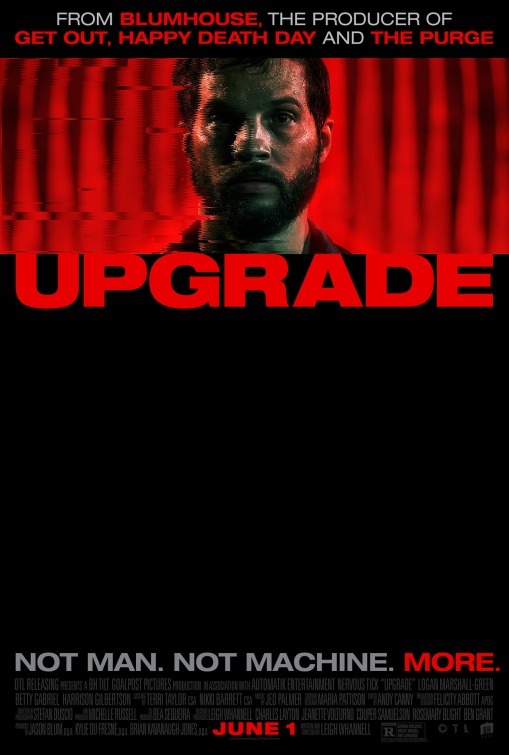 But the film is also spiced up with some gory kills and a potent streak of techno horror, as we get exposed to the fears and anxieties of how technology can impact on our humanity, on both individual and societal levels. And that streak is wide and prevalent enough to land Upgrade onto this year’s ¡Qué horror! Candidates list. * He’s also signed on to write and direct a new iteration of The Invisible Man, as well as tackle a remake of Escape from New York (for which he’s writing the script with the possibility of directing also open). Reviews for Saw (and Saw IV) can be found here (and here); Insidious made the Candidates list in the ¡Qué horror! 2011 rundown. More Logan Marshall-Green can be found in ¡Qué horror! 2011 Candidate Devil and ¡Qué horror! 2016 title The Invitation. Get Out's very own Georgina, Betty Gabriel, appears here as Detective Cortez. She's also currently starring in Season 2 of the brilliant, sci fi-tinged espionage show, Counterpart.